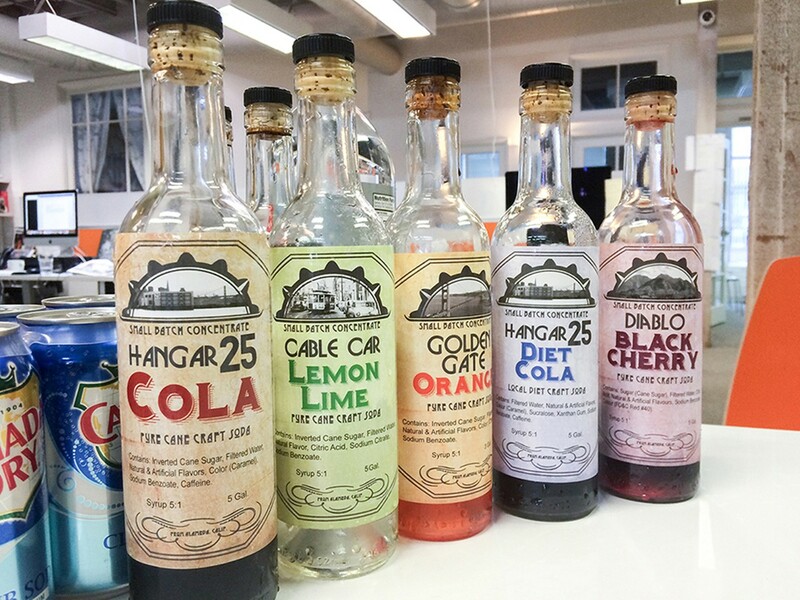 A mix of offerings from Alameda Point Craft Soda Co.
One of the emerging trends of our 2016 election coverage is soda. No, really. That is, taxes on soda. Which, despite the indoctrination by TV and social-media ads suggesting otherwise, isn't a tax on eggs and broccoli. It's a tax on Coke and corn syrup in a bottle, duh. But that's not what matters now. What matters is that, when the soda taxes in Oakland, San Francisco, and Albany and elsewhere hopefully pass on November 8 — as it did in the City of Berkeley already — people are going to drink less soda. Or, at least, that's what happened in Berkeley, according to a recently released study by UC Berkeley. You know what else should happen? When you drink soda, you should drink East Bay-made non-corn syrup, natural soda, because supporting local means you're going straight to heaven. Oh, and soda is pretty tasty when it's not pumped full of crap additives. Some of the team here at the Express has a secret addiction to soda and, in particular, ice-cream floats. One of our staffers even hosts regular "Float Fridays," where he brings in a different bubbly concoction to sample with some 'nilla ice cream every week. So, for this fall's Taste issue, we're giving you four choices of local sodas, which you can either sip stand-alone, or mix with a cow's gift to frozen desserts. Saul's Restaurant and Delicatessen (1475 Shattuck Ave., Berkeley, 510-848-DELI, SaulsDeli.com) is known for this unusual soda option, which we ordered a gallon of to go — and for a price so obscene that we're embarrassed to disclose how much. One staffer took a spoonful and a sip, then made an I dunno gesture with his arms. "It could work, I just don't like soda very much," was his feedback. Useless. Next. A few of us found it "vaguely herbal," and refreshingly un-sweet. Some said it "tastes healthy." Others had less-flattering reactions, calling it "like bad medicine." I personally enjoyed its soft and dry aftertaste, and how, for a soda, it belied that traditional sugary sweetness. Sure, it's not good soda-float soda. But it's a very decent beverage. 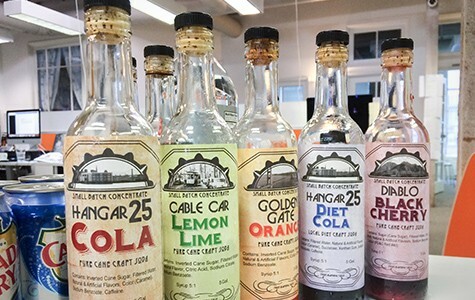 When we told Mark Anthony of Alameda Point Craft Soda Co. that we wanted to sample some of his beverages, he insisted on coming to Express headquarters and running through a presentation. And he brought with him an array of flavors, from orange to cherry to classic root beer. All these sodas are made with 100 percent pure sugar cane. And the cool thing is that a number of East Bay bars and restaurants are using them on the line in lieu of traditional corporate beverages. Drake's Dealership, Jupiter, Scolari's, and Hatch are a few that have made the jump. Memorable sodas, according to the team here, included the lemon-lime (a nice blend of Sprite and 7-Up profiles), the cola (soft on the palette, unlike aggressive Coca-Cola), the Golden Gate Orange, and the tweaked-up ginger soda — which would blend perfectly with a slug o' whisky and a twist of lime. As a float, the root beer and ice cream balanced out nicely, with a pleasantly sweet finish and a light sassafras kick. Elmwood Café (2900 College Ave, Berkeley, 510-843-1300, ElmwoodCafe.com) also offers housemade soda, including an orange soda that would make any Denver Broncos fan blush. They also have softer, more unique soda offerings, such as rosemary or lavender, and French sodas. The orange soda as a stand-alone beverage was light and neutral in character, according to many on the Express staff. Some describe it as Tang-ish — and in a good way. Others praised that it wasn't abrasively sweet. The orange soda paired extremely well with all-natural vanilla ice cream, imparting a refreshing and balanced creamsicle profile. A keeper, for sure. Our final "Float Friday" for this special pre-Soda Tax adventure was Caamaño Bros. Soda Pop Co.'s sarsaparilla. Produced in Berkeley, Caamaño Bros. (CaamanoBros.com) also offers popular flavors such as wild cherry and ginger. Poured from the bottle, sarsaparilla was a classic, excellent, and sweet variant to the usual root beer. The carbonation was dialed in, and its bite complemented the ice cream. Oddly, again, many said they still prefer phony mainstream soda — perhaps that's just the corn-syrup addiction talking — although I certainly appreciate the natural flavors in this offering. And so, when you go to the ballot box on November 8, you'll have four more soda choices in addition to the umpteen million races and ballot measures. The good news is that, when it comes to the local soda, all of them are solid and significantly more palatable than Trump or Hillary. And that's a win.